It's true. I have nothing else to do than play with dolls. I played at Winnie & Tulula's last week, whilst waiting for The Primitique to be built. The doll heads just watched while the arms and legs laid around. Don't forget, there is plenty of great shopping to be done in Athens at Winnie & Tulula's. Great doll playing going on. So excited about your store I can barely wait when you start to post more photos. Have a great week!! It still amazes me how individual doll heads are such a hit. Whenever I've bought them they sell right away. I've picked up old dolls before and told my husband, "Well if it doesn't sell I'll just take the head off!" Sounds pretty morbid doesn't it....but it's true. Good luck with your new store Mindy! Debbie, exactly. I was concerned that they had been soooo done. But, they keep selling! So, I keep buying! Jan, you're right. Some are very creepy! Kate, I can hardly wait, myself! I love a lot of odd things, but the doll parts have never been my thing--dismembered bodies just don't float my boat. The "crack head" babies crack me up! 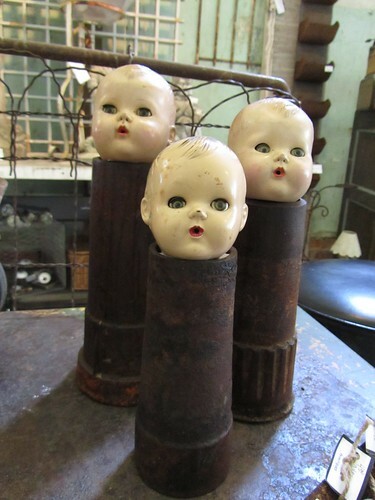 Forget the dolls....I want those rusty things they're perched on! These body parts scare me a little bit. Really. I'm not sure I could put a head on my table and have it staring at me all day. I'm weird like that. the one with no arms and no legs..."
funny girl! you made me laugh! Oooo! Your killen me with all the fabulous doll heads! Not sure how many I have, but I can never get enough! Love um! Get a leg up on shopping! Twist my arm and make me shop! Yep, give me a creepy doll head any day! 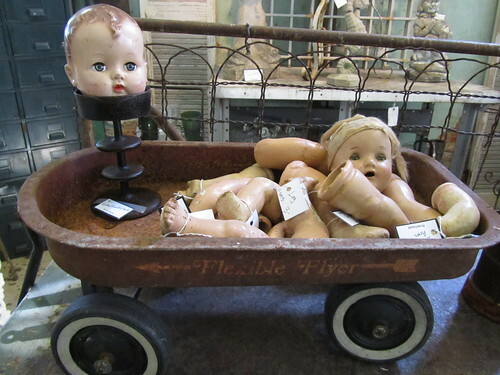 Hey, do you know creepy baby doll head lady Jeanie from Bar W Field in Warrenton? She has the BEST supply anywhere. Mindy, I LOVE your dolls and doll parts! I hear it's somebody's birthday? Best wishes! 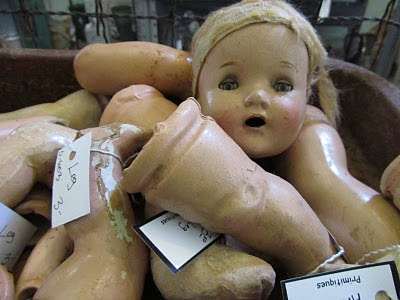 Honestly, the dolls have always creeped me out, something leftover from my childhood I'm sure! You know I love those pretty girls! I do love those rusty things they are perched on as well!